It’s a great new look for a classic old location. We’ve seen the Death Star many times before; it’s in almost every Star Wars movie. But we’ve never seen it quite like this, looming over the atmosphere of a beautiful tropical planet. 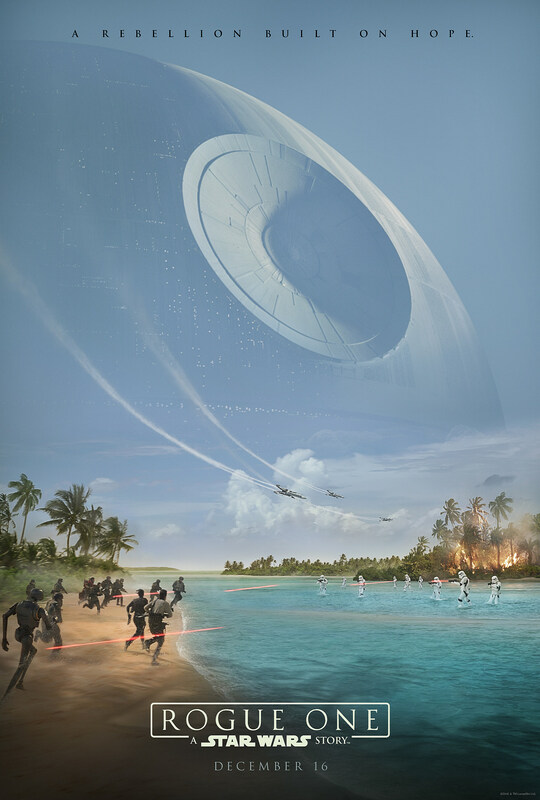 Below a battle rages between the Rebels and the Empire, which we learned in today’s Rogue One panel was filmed in the Maldives, a location so remote that the extras hired to play Stormtroopers had no idea what Star Wars was or who they were playing. Here’s a full-size version of the new poster. Clicking it makes the Death Star even bigger. “A Rebellion Built on Hope” is a great tagline for a movie, particularly one spinning out of a movie subtitled A New Hope. It remains to be seen how the movie turns out, how the reshoots went, how the tone of the movie lines up with Gareth Edwards’ original vision of a war movie set within the universe of Star Wars. But this is a pretty spectacular Star Wars poster. Rogue One: A Star Wars Story comes to theaters on December 16, 2016.